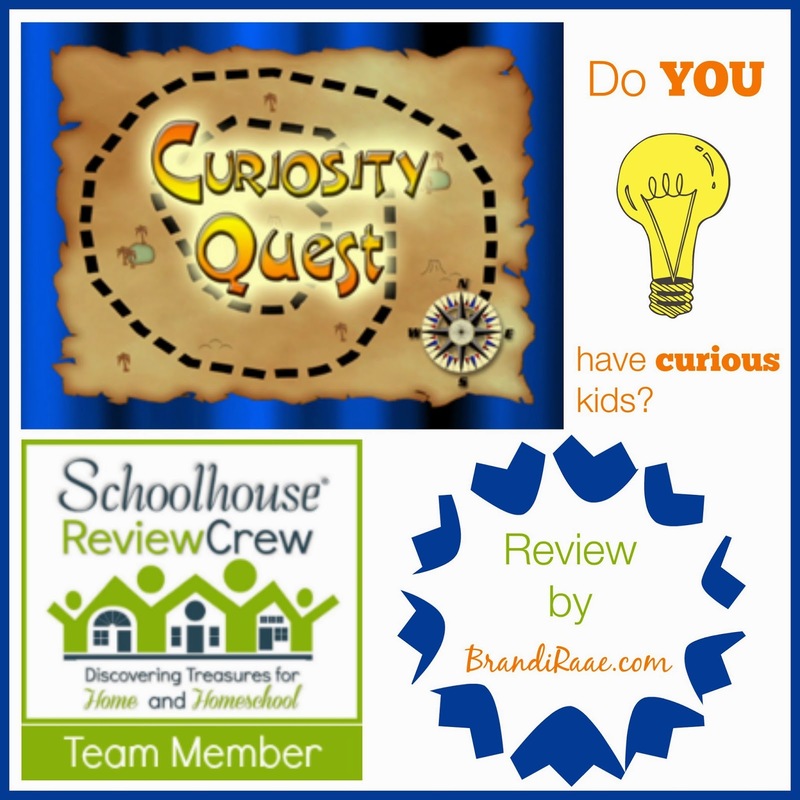 Do you have curious kids? Who doesn't, right? As a Schoolhouse Review Crew member, I had the privilege of watching some neat DVDs with my family and learning new things about fruit, fungi, and sea animals. Curiosity Quest is a fun, unscripted, educational television program geared toward children ages 7-14 that airs on over 100 PBS stations across the U.S. Each episode's adventure begins with just one person's curiosity. Joel Greene, the show's host, travels all over the country to answer curious viewers' questions. The website offers viewers the chance to purchase all of their favorite episodes. There's even an option for becoming a member in which viewers can pay a monthly fee to receive DVDs every month. The particular DVD Combo Packs we received can be purchased on the website for $24.95 each. I originally planned to watch these DVDs during school hours with my children, however, we ended up watching most of the episodes at night during our spring break. I let my kids, starting with my youngest, take turns picking which ones they wanted to watch. (My children are 14, 12, and 8.) While winding down for the evening, we were not only entertained but educated as well! The DVD Combo Pack - Produce includes three episodes on one disk which show how three different produce products go from farm to store. Each episode is approximately 30 minutes long. Joel traveled to a fresh, cranberry-growing Wisconsin farm in October. It was already so cold there that it started snowing! We learned that cranberries are perennials, where they grow, when growing season starts, and when harvest starts. We saw how cranberries were collected, measured, and packaged, and we learned what size a cranberry needs to be and how to tell if it is good and not a reject. We heard about a few health benefits and even found out who named the cranberry and why. How do you know when a cranberry is ripe? What do cranberries taste like? 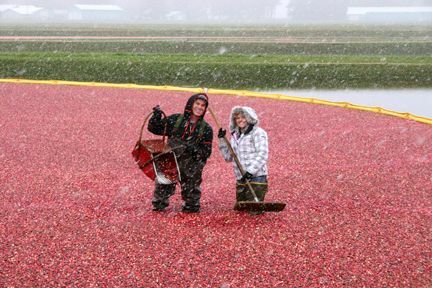 Why do farmers flood the cranberry field? Joel went to the Gillette Citrus Company in Dinuba, California to show us all about harvesting, washing, sorting, and packing oranges. We also found out which oranges have seeds, which ones are harvested in winter, which ones are harvested in the summer, and which types are used for juice. We watched machines sort oranges by size and learned how they tell the good oranges from the bad ones, we learned how many oranges are grown in the U.S. per year, and we found out who brought the first orange seedlings to America. What is your favorite type of orange? 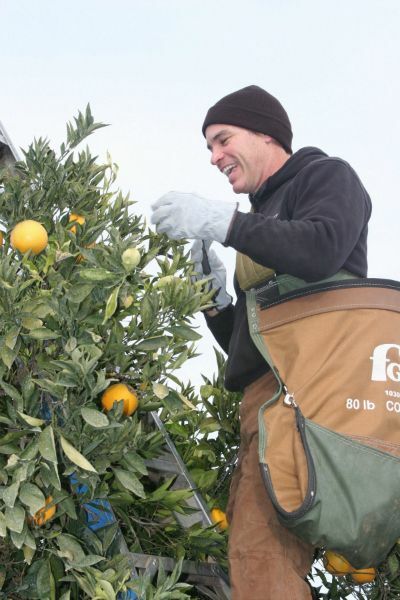 What type of climate do oranges grow in? How do they make the oranges ripe? Do you have fresh fruits and vegetables at your house? How do oranges get to the supermarket? Watching this episode really made me miss having my very own orange tree in my backyard. Freshly squeezed orange juice is the best! In Watsonville, CA Joel visited Monterey Mushrooms farm and facility where we learned all about mushrooms - from preparation to packing to shipping. 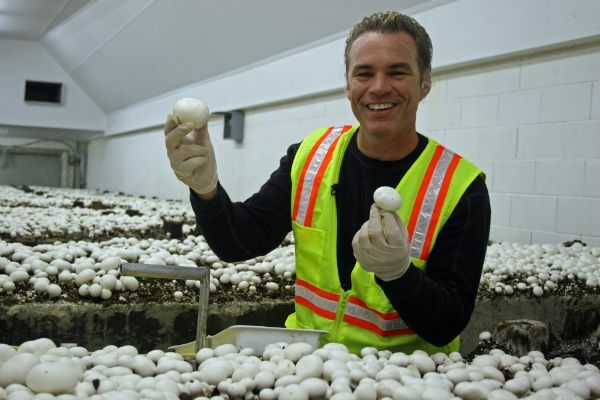 We learned when and where mushroom farming started, all the prep that has to take place before growing mushrooms, and the ideal growing temperatures and conditions. We observed the phases of mushroom growing - I think I counted 5 - and were told how many pounds of mushrooms are picked per hour. Joel also went to Royal Oaks where the mushrooms are packaged, and we also learned about Portabellas while he was there. What is the first step to growing a mushroom? How many mushrooms can you pick an hour? How big can a mushroom get? 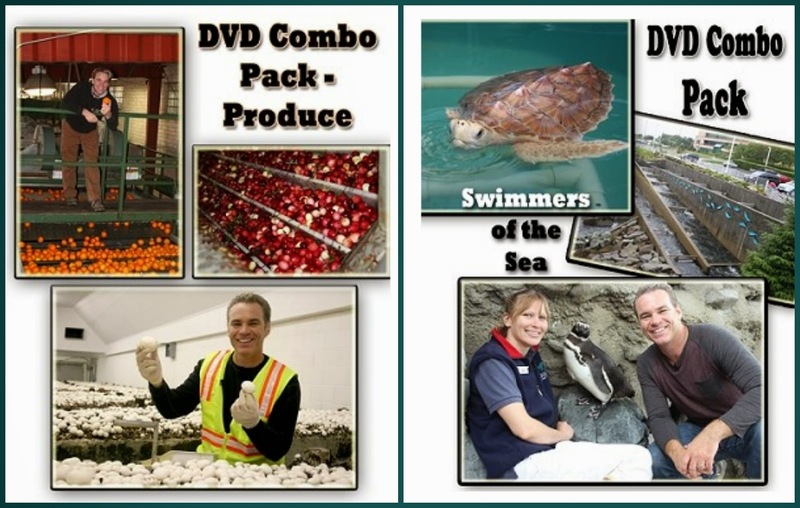 The DVD Combo Pack - Swimmers of the Sea includes three episodes on one disc which show the life cycles of penguins and salmon and the rescue and rehabilitation of sea turtles. Each episode is approximately 30 minutes long. 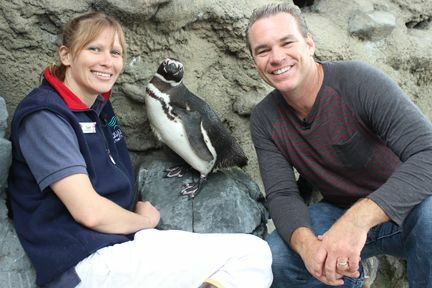 Joel dropped by the Monterey Bay Aquarium in Long Beach, California to teach us all about penguins. We mostly learned about the temperate Magellanic penguins. Any guesses for whom they are named? We witnessed how their food is prepared, what they eat, how they eat, and how much they eat. We also learned about porpoising, preening, penguin bones, and why penguins are black and white. What does it mean to molt? What does a penguin sound like? Joel journeyed all the way to Juneau, Alaska to visit a salmon hatchery. The Alaska Department of Fish and Game informed us on the life cycle of salmon, how many species are in Alaska, where they start out, how long they stay in the hatchery, and when they are let out. It was neat to discover that salmon spend part of their lives in fresh water and part of their lives in salt water and how they find their way back to the same place in which they were born in order to spawn. We also found out what happens to the fish after they spawn. Do you know? 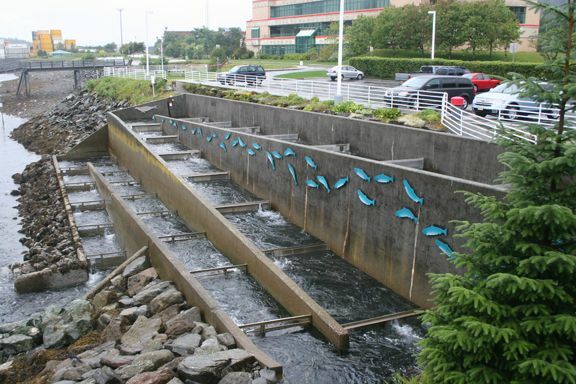 Why do we need fish hatcheries? When do salmon lay their eggs and why? Learning about salmon was interesting, but I do not like to eat them or any kind of fish really. My husband and kids are so deprived! 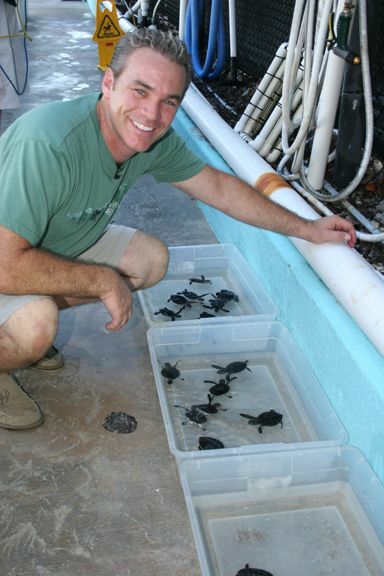 Joel stopped by The Turtle Hospital in Marathon, Florida to give us the scoop on sea turtle rescue, rehab, and release. We were told how many turtles the hospital has at one time and got to meet several of the turtles living there. We also saw one turtle who's missing a fin and found out which one has been there the longest. We learned all kinds of neat facts, too, such as the types of food turtles eat, what their noses feel like, which turtle is the rarest, how big the largest sea turtle can get, where sea turtles lay their eggs, how hatchlings find their way to the ocean, how turtles are able to drink salt water, and why it looks like they cry. How much can a sea turtle weigh? How can you tell a boy sea turtle from a girl sea turtle? How long can a sea turtle live? Why does everyone love sea turtles? The Turtle Hospital has an education center that the public can tour. What a fun field trip that would be! Our least favorite part of the shows were the Fun Facts because sometimes it was difficult to understand what the kids were saying. Subtitles would be really helpful for this part of the program. It was such a small part of the program, though, that it wasn't really a big deal. Also, just as an FYI, out of the six episodes we watched, two of them briefly referenced evolution. Check out what other Crew Members thought by clicking the banner below.